Over the last few weeks, even if you blinked, you couldn’t miss the name Tupac Shakur. More than 20 years after his death, the rap legend’s name has been everywhere, thanks to the Benny Boom-directed biopic All Eyez on Me which premiered last weekend. The buzz around the movie (and even the initial negative reviews) have pushed ‘Pac into the mainstream conversation once again, even more so than his 2012 Coachella cameo as a hologram did. But the reality is that, box office buzz or not, Tupac Shakur is a hip-hop icon whose name is instantly recognizable, in the U.S. and around the world. His name can be found splashed across T-shirts, hats, jewelry, posters, and other merchandise, and has been featured in murals from Oakland to New York City. It’s hard to imagine ‘Pac going by any other name—but he did, at one point, and it only lasted about a year. The rapper was born Lesane Parish Crooks on June 16, 1971. 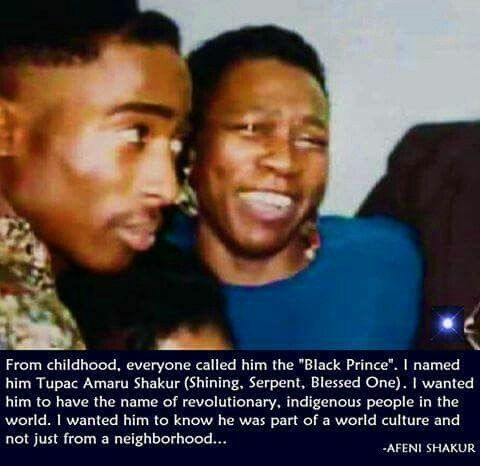 While he was still an infant, his mother, Afeni Shakur, changed his name to Tupac Amaru Shakur, which made him the third well-known person to carry the name Tupac Amaru. “Tupac Amaru” is derived from the name Tupaq Amaru, which, loosely translated, means sierpe resplandeciente or “shining serpent” in Quechua (the indigenous language of the Andes and second-most spoken language in Peru). The first known Tupac Amaru was an indigenous monarch—the last Sapa Inca, for any 16th-century Latin American history buffs out there. The second known person to carry the name was José Gabriel Condorcanqui—better known as Tupac Amaru II—an 18th-century Peruvian revolutionary of indigenous blood (he claimed to be a direct descent of the first Tupac Amaru). The second Tupac led the largest indigenous uprising in Spanish American colonial history. As many indigenous people of the Americas were, both were executed by the Spanish. “I wanted him to have the name of revolutionary, indigenous people in the world. I wanted him to know he was part of a world culture and not just from a neighborhood,” Afeni reportedly said of her son’s renaming. The origin of this quote is unknown; it’s been widely circulated across the internet, plastered on shareable graphics and Tumblr posts. But historians say there’s evidence that the Black Panthers, which Afeni was a member of at the time, were studying and paying close attention to international liberation movements. According to Walker, in the late 1960s and early ‘70s, there was international interest in Tupac Amaru II (remember, that’s the 18th-century revolutionary) because of “global fascination with third-world political struggles and anti-colonialism.” At the same time, in Peru, the name and image of Tupac Amaru II became a national symbol during the regime of General Juan Velasco Alvarado, a commander of Peru’s armed forces who overthrew the country’s previous president in a military coup. General Velasco became known for his nationalist rule, and his agrarian reform and education reform policies focused on bringing up the poor and indigenous communities of Peru. For many, Tupac Amaru II came to represent an indigenous and mestizo revolution—in other words: a revolution for the people. Here’s where it gets tricky. It is true that Tupac Amaru, the Inca chief, was beheaded by the Spanish. But Tupac Amaru II, the revolutionary who came after, was also tortured upon being captured during the rebellion. When the Spanish attempted to tear off his limbs, his body resisted the four horses’ strength. He eventually was beheaded in the same plaza in Cuzco, Peru where his namesake suffered the same fate. There is only way to know for sure whether the most recognizable name in rap is an homage to an Inca chief or a Peruvian freedom fighter centuries later. That would be to ask Afeni Shakur if she were still alive today. That may have been the only time he spoke about his name on tape, and may be the only time he connected his name with Peruvian indigenous history on the record. But it’s clear that, from his early beginnings, Shakur had all makings of a revolutionary: based on not just his name, but also the family he was born into. When he began to use his platform, ‘Pac was able to share his truth through rap and the written word about his multifaceted experience as a black man in America, even if the complex truth was the last thing anyone wanted to hear. “I’m not saying I’m gonna change the world, but I guarantee that I will spark the brain that will change the world,” said ‘Pac in a recorded interview. His fight for freedom differed from his namesakes, but they are unified in the fight to change and inspire their respective worlds. That’s what a leader, warrior and freedom fighter does.